Hi everyone, no new project tonight I am afraid, but I do have a winner. Thank you so much to everyone who left comments on my Bo Bunny blog post here and on the Bo Bunny blog. Your comments made my day. I was reading them at work on my first day back after a 9 month maternity leave. So I really needed something to cheer my up that day! Twenty-nine people left comments so I entered 1-29 into the random number generator at random.org and the lucky winner was number 5. Very sweet mini album and love the zebra layout! Congrats Sue! Email your mailing address to scrapcetera@aol.com and I will get your Bo Bunny goodies out to you! There is still the prize to win from the Bo Bunny blog. Bo Bunny will be picking a winner for each designer on each day this month. All the winners will be posted on the Bo Bunny blog at the end of the month. So keep leaving comments and check back at the end of August to see the list of winners. Good luck and as always thanks for visiting my blog! Hi, hi, hi! It's a late post tonight because boy have I been busy! School starts tomorrow and there is so much to do and prepare. I am definitely missing the carefree summer days and spending time with my girls. But I do love fall and it is exciting to start a new year with new students too. Yesterday Nikki Sivils started shipping all her new lines to stores. 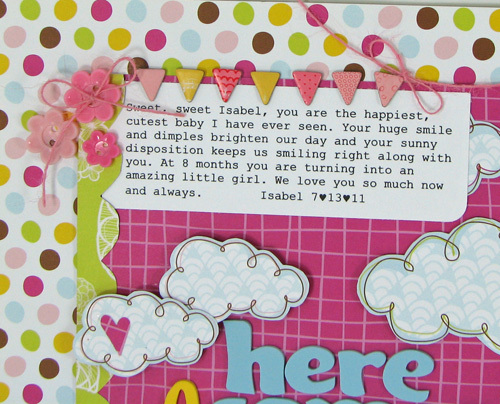 I was lucky enough to design with her papers over the summer and I love them all. I really can't pick a favorite line! They are each cute in their own unique way. So which one to show today? Decisions, decisions..... Hmmmm......how about this one? This is Frances playing with her favorite little friend Curious George. She loves getting into the band aids and covering all her dolls with them! She has a little doctor's bag too with all her instruments. She says "I am making George feel better mommy". She is seriously the sweetest thing when she's not causing all sorts of trouble. It's kind of hard to stay mad at her. 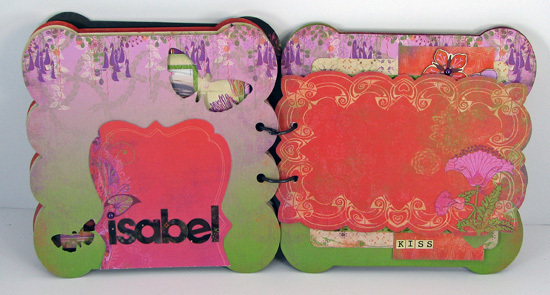 There's also a new guest designer on Nikki's blog today- the extremely talented Allison Davis! You can read all about her on the BLOG. She created the cutest projects. You don't want to miss them! Today is my day on the Bo Bunny blog! Each design team member got a day in August to write a blog post introducing themselves and sharing some work. My post is HERE. If you visit and leave a comment you will be entered to win a Bo Bunny prize package too! 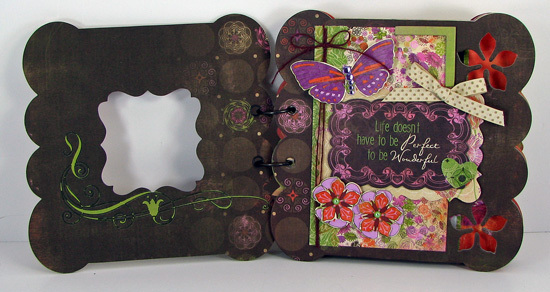 I promised a brand new layout to share and another giveaway on my blog! So leave a comment on this post and I will pick one person to win some Bo Bunny goodies. 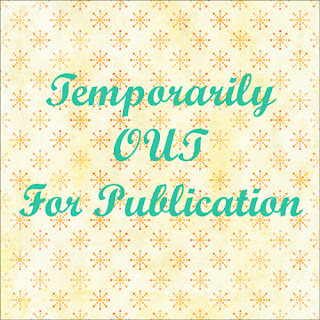 So there are TWO giveaways- one on the Bo Bunny blog (leave a comment there) and one on my blog (leave a comment here). Here is my layout of little Isabel dressed up in her zebra bathing suit- too cute! 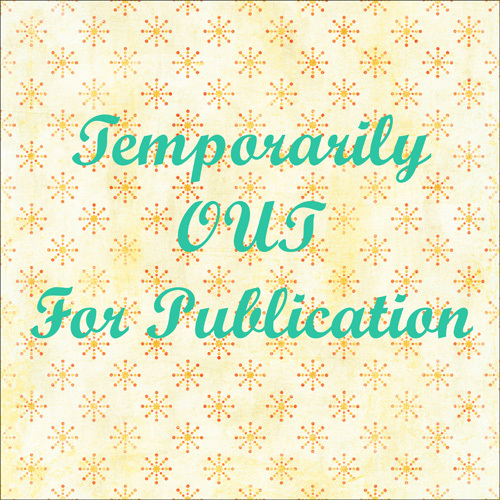 supplies: Bo Bunny Zoology papers, noteworthy,12x12 chipboard, 12x12 stickers, ribbon and jewels; Bo Bunny double dot cardstock; American Crafts Thickers; Cricut Expression; Cricut Create A Critter Cartridge. 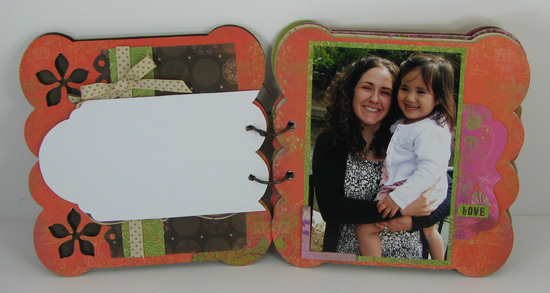 I also created this mini album to share on the Bo Bo Bunny blog today. 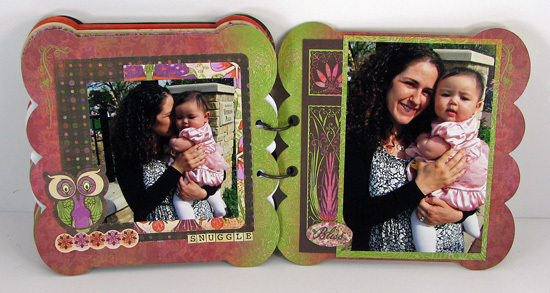 I knew this "Garden Girl" mini edgy album wasperfect for the photos of my girls and me on Mother's Day. I chose the saying "Life doesn't have to be perfect to be wonderful" after one of "those days". Frances wanted a cookie for lunch and I told her no, she had to eat her lunch first. The plate of chicken nuggets, fruit and carrots was thrown all over the floor while she yelled "Mommy I dont want you anymore!" I turned around for a minute and Isabel crawled over to the dogs' water bowl, flipped it over and proceeded to splash around. I still don't know how she crawls that fast! When she tried to start crawling away and her wet knees kept slipping on the floor I couldn't help but laugh. They may not always behave like perfect little angels, but I wouldn't have it any other way. Frances will not take pictures with Isabel so I made a section for each of the girls. Here is Frances's section. I punched holes in one of the noteworthy tags and included it to journal on. This is Isabel's section. I included another noteworthy tag to put my journaling on for her. Thanks for coming by today and visiting me! Good Thursday morning! I have some exciting news I have been waiting to share with everyone. 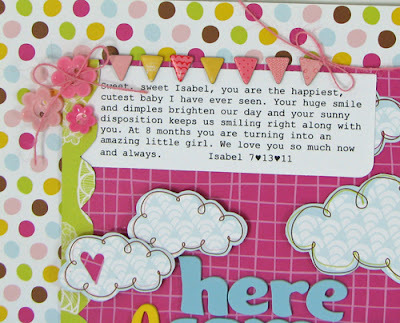 I was asked to take over the Social Media Coordinator position for Nikki Sivils, Scrapbooker! I am so excited and have been easing my way into the last few days. 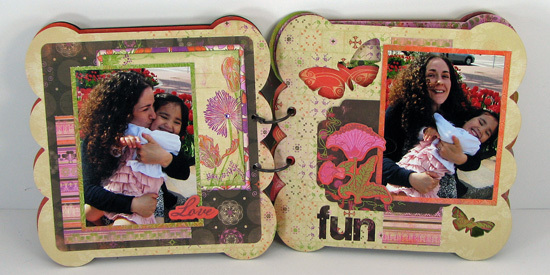 You will be seeing lots of me on the Nikki Sivils facebook page, twitter account and over on Scrapbook.com. Please come on over to the facebook page and "like" us if you haven't already. I can't wait to have fun with all of you! 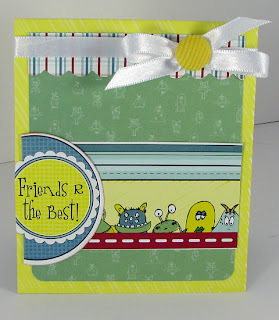 I will end with a project using Nikki Sivils cute, cute, cute new paper line "My Little Monster". This is my little monster at 6 months old. Hard to imagine this was over 2 years ago! Hi there! I hope everyone's weather is as nice as ours! Finally it is GORGEOUS out and I have to go back to work next week. I am just trying to enjoy it while I can! 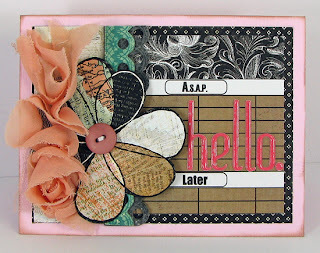 Today I have a post up on the ScrapRoom blog. 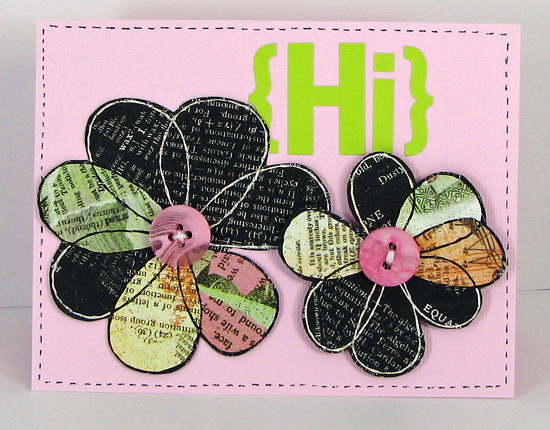 It is about making quick cards from your scraps. 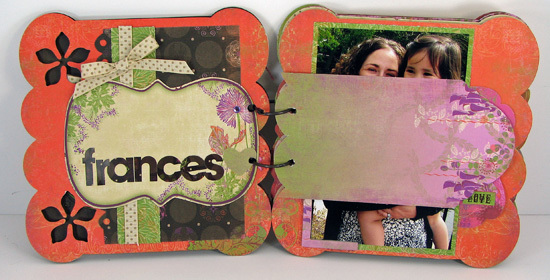 Here are the two cards I created using only scraps from the August Double Shot kit. You can read my tips and tricks HERE on the ScrapRoom blog. Hi there! 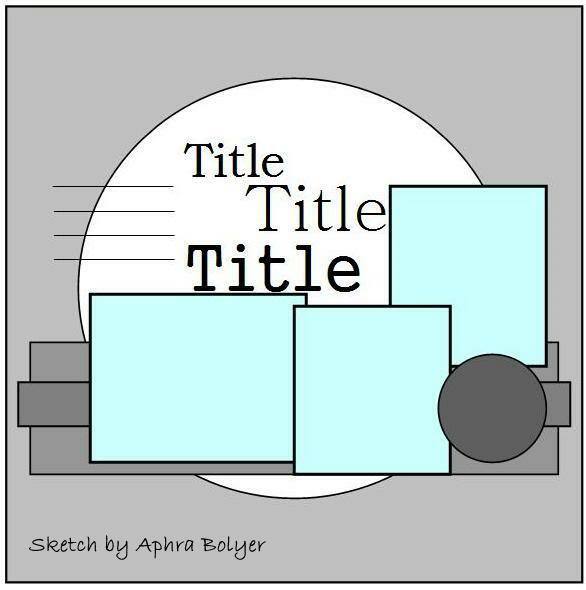 How about sketch today to get you going? The monthly sketch challenge from The ScrapRoom is up on the blog. 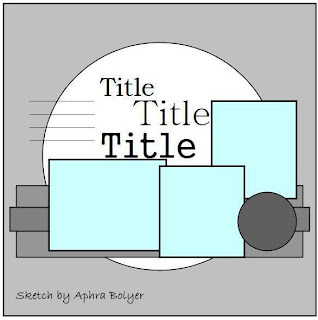 This month's sketch was provided by DT member Aphra Boyler. And here is my layout based on the sketch. 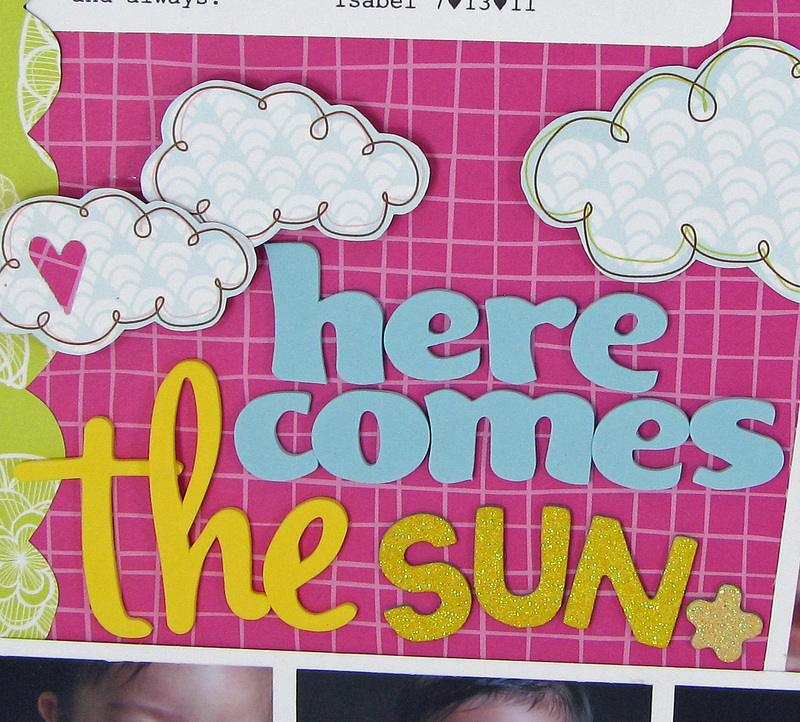 I used the Basic Grey "Out of Print" papers from the Double Shot kit. If you want to play along check out the blog and there ARE prizes involved! It's a new week and I have some new projects for you! At CHA last month I was given a few of the new Nikki Sivils stamp sets. They are so cute I couldn't wait to play with them! Thank you Unity! 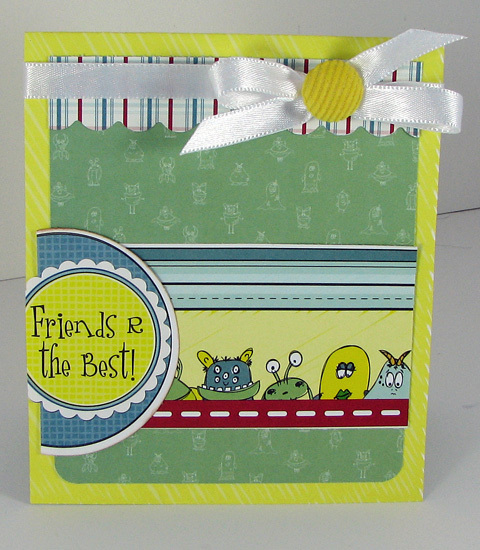 So here's a few cards I whipped up with Nikki's paper and the Unity stamps. 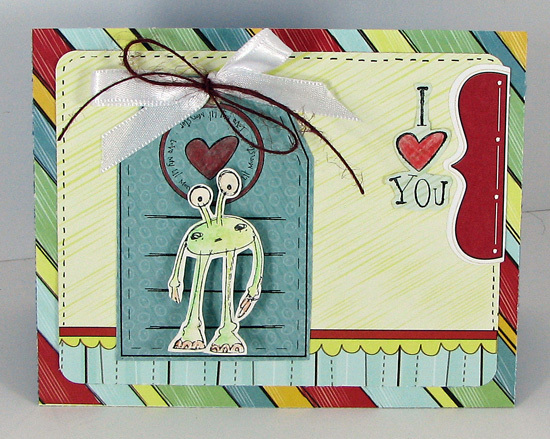 On this one I stamped the Monster, tag and sentiment using the Unity stamps. 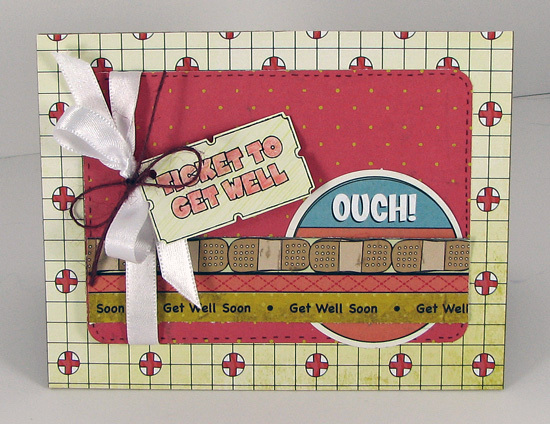 On this one I stamped the ticket. This one doesn't have any stamps, but I love the little monsters! 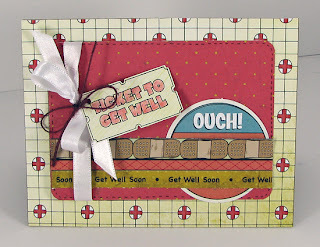 Supplies: Nikki Sivils Get Well Soon and My Little Monster collections, Unity stamps, Ink from TPC studios. I also have to give out a BIG THANK YOU to TPC Studios who so generously gave me a few ink pads to try out. The ink was awesome! I used the Clearly Better ink pad for my projects above and love how smooth it stamped on my papers. Thanks for coming by! Have a great Monday! Here she is- my little ray of sunshine. I couldn't have asked for a happier, more content baby. She is always laughing and smiling and of course bringing sunshine whereever she goes. 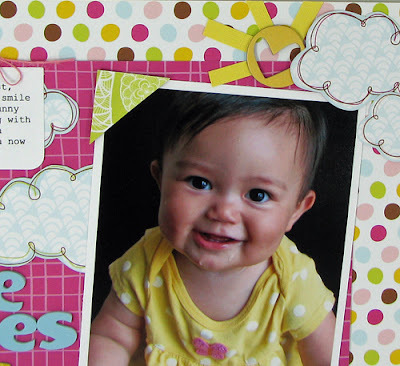 It only seemed fitting that I used American Crafts "Hello Sunshine" line for this sweet girl. Thanks for visiting today and letting me share my new favorite layout with you. The August ScrapRoom Kits are UP! 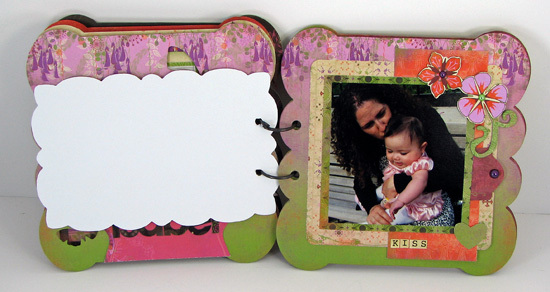 One of my favorite lines is in the Flavors of the Month kit- American Crafts Campy Trails. I am an outdoors girl and this collections FUN! 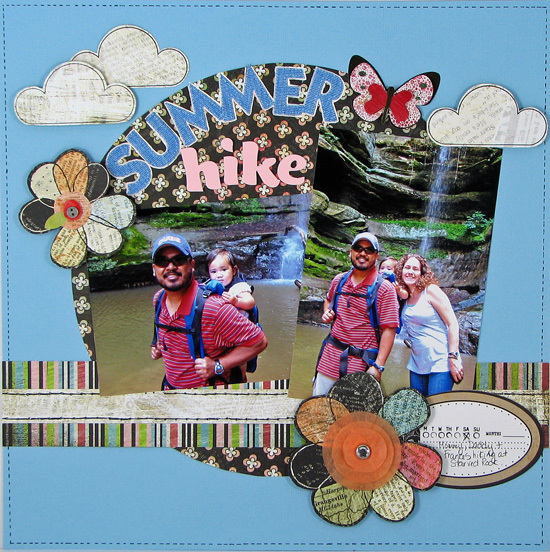 I used the kit to create this layout of my little girlie Frances last summer on one of our hikes. This girl loves to play in the dirt and here she is playing and "tasting" the dirt, LOL! I also used Jenny's super cute banner tutorial that can be found on The ScrapRoom blog HERE. Thanks for stopping by and I have lots of other projects with the Double Shot kit to share latter this month so please come back! Have you visited Pencil Lines? Happy Monday to all and I hope this week will be great for everyone! 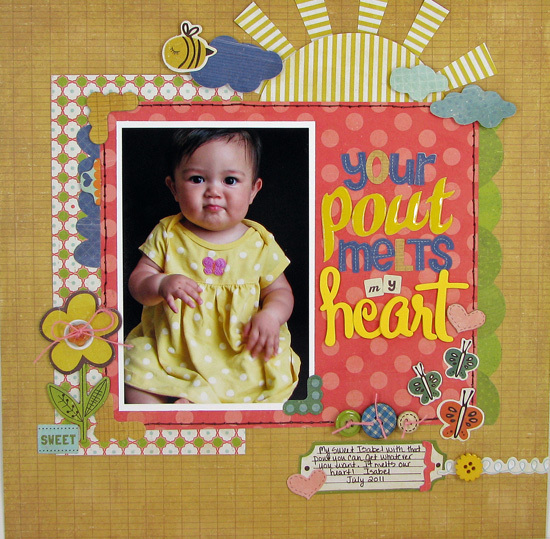 I used the sketch to create this layout about my Isabel's cute little pout. This is her pouty face and I just can't resist it. I melt everytime. Boy, oh boy, is she going to use this face against me when she is older- lol! Please head on over to the Pencil Lines blog to see the design team's amazing layouts.